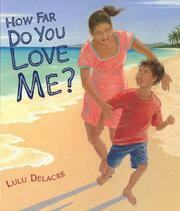 A simple question enables the author/illustrator to travel around the world in her poetic and visual answers. Starting on a Vieques, Puerto Rico, beach, a mother answers the question posed by her son and tells him her love ranges to places as far-flung as the glaciers of Antarctica, the Ladakh Himalayas and the Great Barrier Reef. Delacre uses her soft pastels to depict such images as the sinuous natural forms of a desert in the Sinai Peninsula, Egypt, where a woman in traditional dress cradles an infant, and the text reads: “I love you to the crests of the desert / where the wind sweeps sand from the dunes.” As the book comes full circle, the original mother tucks her son in and asks, “And how far do you love me?” He answers, “I love you to the moon!” On the last page, in a beautiful, deep night sky, the question appears in different languages in original scripts (with no transliterations or pronunciations, a missed opportunity). Although the place names on each double-page spread can be difficult to read, that information is also provided on a map at the end.